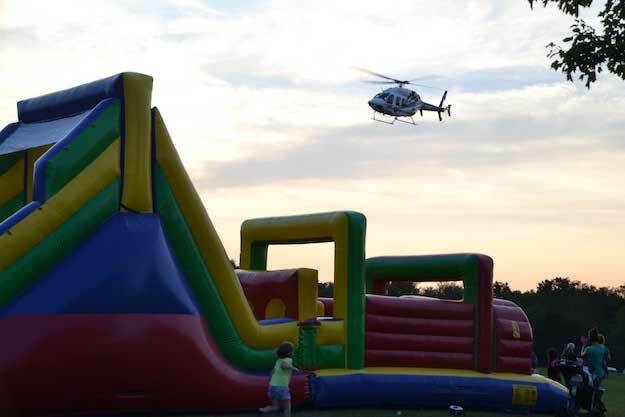 ALBION – Residents get a close look at a Mercy Flight helicopter on Tuesday during the fourth annual National Night Out in Orleans County. About 1,000 people attended the event, which provided a chance to meet local law enforcement agencies, fire departments and numerous agencies that provide services to people in need. “Every year it gets bigger and better,” said Roland Nenni, the chief of the Albion and Holley police departments. He is one of the coordinators of National Night Out. The goal is to bring together the community in a drug-free event where parents don’t have to spend money. There was no cost to parents and their children for food and the other activities. The organizers also wanted to connect community members to the police officers, firefighters and other agencies who provide assistance. Madison Schultz, 2, of Medina sits on the lap of her aunt Sami Lynn Denniston, 7, of Middleport. 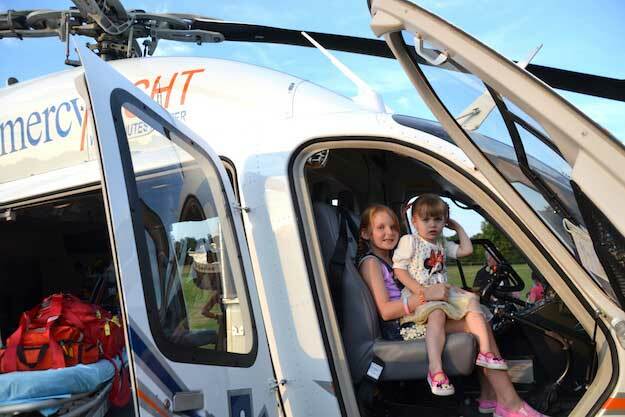 Children were welcome to sit in the pilot’s seat and get a close up of the aircraft which is used to transport people with life-threatening injuries and illnesses. 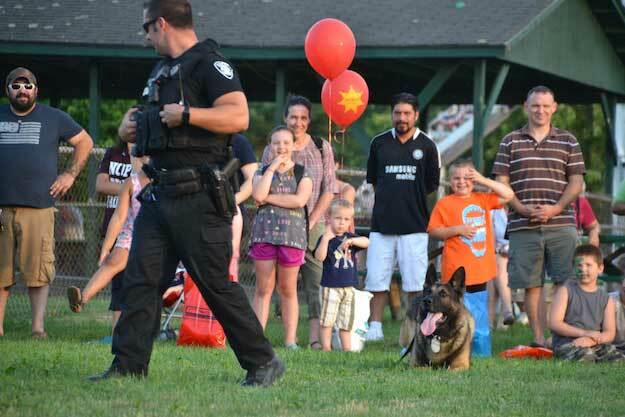 Robert Wagner, an Albion police officer, did a demonstration with Rex, the department’s K9. Wagner had Rex sit and show other obedience. Rex also found a ball that one of the children hid in the field as part of the demonstration. 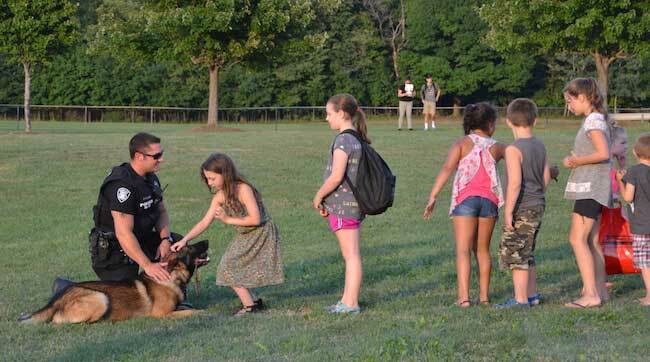 Children meet Rex, the K9, and officer Robert Wagner after their demonstration. 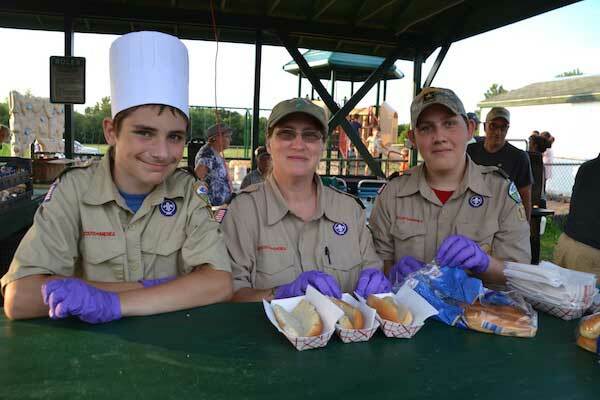 Boy Scouts from Troop 175 in West Barre helped serve hot dogs and chips. They teamed with Light of Victory Church in Albion to serve more than 700 hot dogs. From left include Dakota Anstey, Mary Barry (Cubmaster) and Ivan Barry. The YMCA brought an inflatable obstacle course. 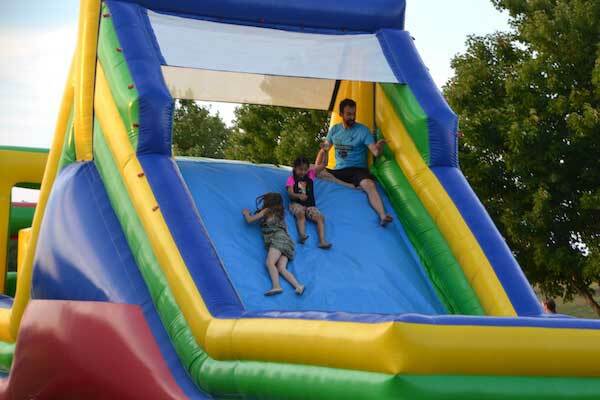 Greg Reed, the Y director, gives kids an encouraging word as they slide down the inflatable. 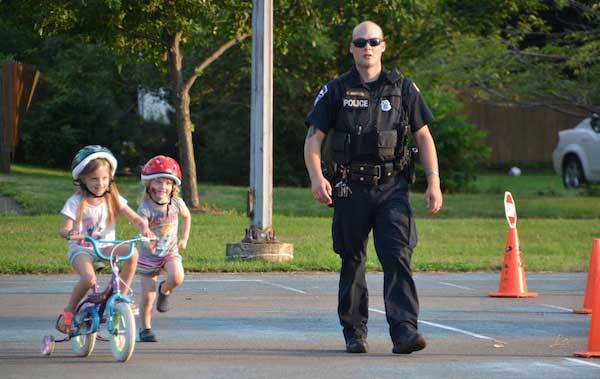 Jaiden Livingston, 6, and her sister Cadence, 4, of Albion follow Medina police officer Corey Ambrose in a bike rodeo that was part of National Night Out. 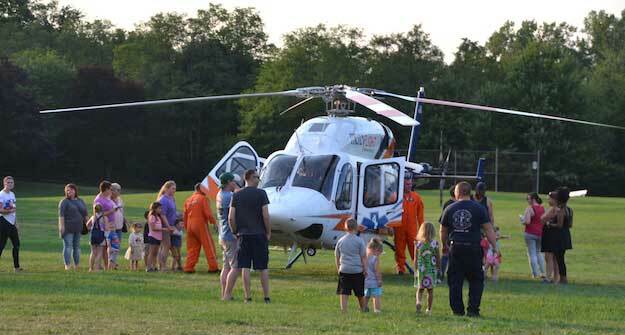 Mercy Flight takes off after the event ended around 8 p.m.